Here are a few cute new titles available now to consider this Spring and Easter season . . .
Oliver , by Christopher Franceschelli and published by Lemniscatt USA, is unlike any book I've ever seen before. It is a novelty book, described as "page over board." Although this book presents as a very thick board book in some respects, it is only 8 page spreads in length. It feels like a very large chunky book with a simple story and text. 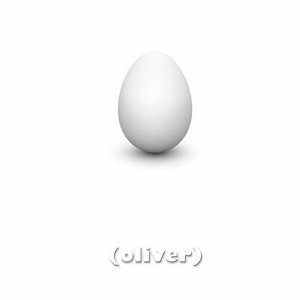 Oliver tells the story of an egg (named Oliver, of course) whose activities are limited. He can roll to one side or the other and can even roll on his head. "Until one day . . . everything changed." Suddenly, of course, Oliver hatches! As I said, this book is very simple. I would say that it is best suited for ages 1-4 (at most) but is presented in a manner that makes even its simplicity intriguing. 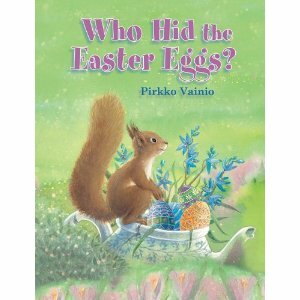 With talk of Spring and Easter (and eggs) in the future, this is a cute addition. 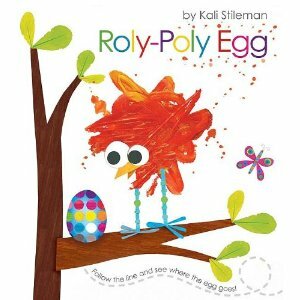 Lastly, check out Roly-Poly Egg which is a new Spring title which comes courtesy of Tiger Tales books. Bookworm1 (age 4 1/2) was a big fan of this one, breaking into a huge smile at the end of it. Splotch is the bird you see pictured on the cover. Splotch lays an interesting "small . . . spotty . . . and perfect in every way" egg that unfortunately gets knocked off the tree branch! (Poor Splotch doesn't have a nest!) Follow the dotted lines to see where Splotch's egg goes until the surprising and very fun and altogether perfect ending. I love the look of Splotch and the bold, bright colors used in the illustrations. This book is both written and illustrated by Kali Stileman and I would say she did a fantastic job at connecting with her intended audience. Again, we ended this book with a huge smile and heartily recommend it to you. Thank you to Lemniscatt USA, NorthSouth Books, and Tiger Tales for your generosity in sending copies of both of the above titles for my consideration. Loved 'um! AWE! They really do sound like such fun! Very cute, making order cards for all three! Thanks for the lively review of Roly Poly Egg. So glad that it made Bookworm smile!